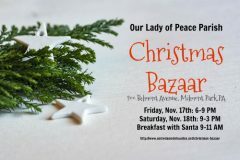 Holiday shoppers can enjoy breakfast, lunch or dinner with Santa at Our Lady of Peace Parish’s upcoming Christmas bazaar. The event will begin on Friday, Nov. 17 at 6 p.m., with shopping and dinner available. The bazaar will reopen at 9 a.m. on Saturday, Nov. 18, featuring breakfast with Santa, lunch and more shopping until 3 p.m. Gift baskets and treasures from Grandma’s Attic will round out the fun.